“This, I realized, was what it would look like to go up against a killer who knew more about detectiving than we did–a professional as opposed to talented amateurs like ourselves. If mystery solving’s truly a game, as Valmont had said at dinner the night before, then there was one conclusion I couldn’t escape. It’s 1893. Otto and Gustav Amlingmeyer find themselves convalescing at a Texas Angora ranch (well, Gustav is convalescing; Otto is going stir crazy) after the events of The Crack in the Lens. Luckily, (for Otto) the downtime has been put to good use–his latest manuscript (being Gustav’s official biographer, Otto acts as a Watson like scribe–minus the doctoring) is finished and ready to be mailed to the New York publisher of their “Holmes on the Range” adventures–one Urias Smythe. Meanwhile, back in New York, Urias Smythe has been busy, and when Otto heads to the local Western Union to submit his manuscript, he finds a missive from Smythe to hop the next iron horse to Chicago. Urias has enrolled the brothers Amlingmeyer in a contest at the World’s Columbian Exposition, pitting their talents against other amateur detectives for the title of World’s Greatest Sleuth! Upon arrival in Chicago, the brothers meet the competition. There’s King Brady, looking awfully spry, Eugene Valmont, former French policeman (mildly disgraced), Boothby Greene (Sherlock Holmes look-a-like if nothing else), and of course, the team of Diana Corvus (possible paramour?) and Col. C. Kermit Crowe (disgruntled former employer to the Amlingmeyers). They’ve all been brought together for a publisher funded sleuth, a treasure hunt of sorts for amateur detectives. Each day, the puzzlemaster, one Armstrong B. Curtis, will supply clues to each of the teams, and the first to bring him and William Pinkerton (son of Allan and judge of the event) a golden egg hidden on the grounds shall be declared that day’s winner. At the end of the contest, the sleuth with the greatest skills, or at least the ability to solve word puzzles, would be walk away with $10 000 and the aforementioned title. Of course, nothing comes easy for the Amlingmeyers. First of all, Gustav can’t read, so Otto’s along for the ride. Secondly, Otto finds himself out of sorts seeing Diana Corvus once again. Diana epitomizes the girl who got away, and she’s working with Crowe, a man who despises the Amlingmeyers. Thirdly–she’s Crowe’s DAUGHTER!! One final distraction: by the end of the first day, the puzzlemaster is found dead, face first in a giant wheel of Canadian Cheddar (World’s Largest, they say!). From the start, Gustav had little patience for the contest, more concerned with justice for the dead than some silly riddles and a golden egg, and with the help of Diana, they’re on the trail of the killer, a killer who has all the skills of a world-class detective. Trailed by a never-ending series of bearded men (sinister, eh? ), the brothers must compete for the prize, solve the murder and manage not to get killed, preferably in that order. 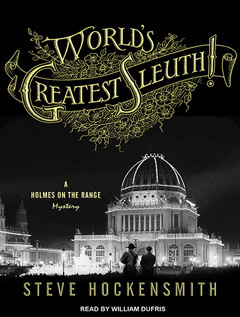 World’s Greatest Sleuth is the fifth and latest instalment in the Holmes on the Range series and a worthy addition. If you like witty repartee, a decent mystery, and some historical relevance (such as a walk through the 1893 World’s Columbian Exhibition), then this tale of the cowboy detectives is right up your alley. Steve Hockensmith maintains his own blog, aptly titled Steve’s Blog , where you can keep abreast of his latest exploits and browse his earlier works.